Choosing the best cutlery for your uses is one of the most important things you can do for your cooking skills. This kitchen cutlery buying guide will help you make the right choice. There's a reason why on the show, Top Chef, the loser is told to "Please pack your knives and go." That simple sentence is particularly, er, cutting, because knives are the backbone of any chef's arsenal. They care for their knives obsessively, sharpening and honing them frequently, and storing them carefully in knife guards and bags. For home cooks, too, having the right set of knives can make a world of difference in your cooking. Certain knives are suited for certain types of tasks, and if you're using the correct knife, you'll find cooking easier and more pleasurable. Those 10-piece knife block sets may have you believing otherwise, but you really only need a few different knives to accomplish most cutting tasks. Avoid buying a set, even if it seems like a good deal, unless you are certain that you will frequently use every single knife in the set. Chef's Knife: This large, all-purpose knife can be used to chop vegetables, cut up a chicken, slice meat, mince garlic and herbs and much more. If you watch cooking shows, you'll see that it's typically the knife you'll see a chef using the most, because of its versatility. Chef's knives come in a range of lengths, from 5 to 10 inches. Choose one that's as big as you feel comfortable with, keeping in mind that a longer knife will naturally give you more cutting space. You'll also want to hold the knife and make a few cutting motions with it to see if it feels balanced in your hand and that the handle is comfortable. 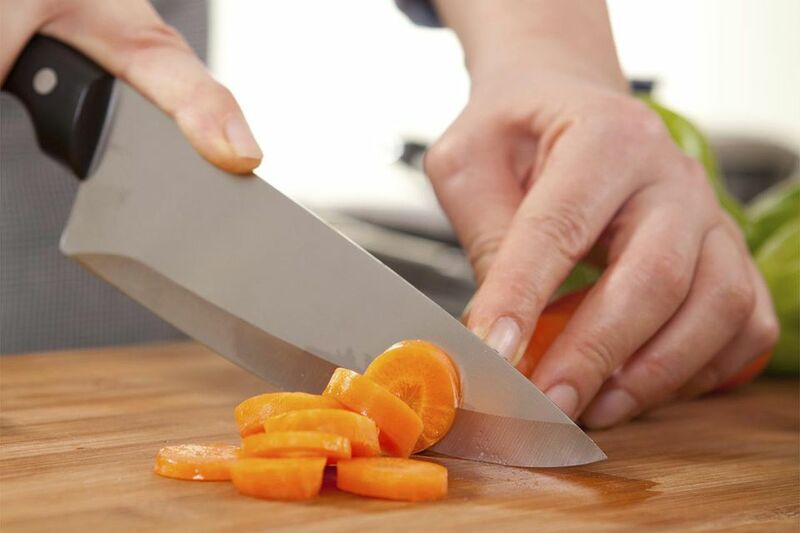 Paring or Utility Knife: A small, 2- or 4-inch knife is ideal for finer kitchen tasks, like cutting small vegetables and fruits, mincing herbs, trimming fat from a piece of meat or slicing a wedge of hard cheese. If you find the tiny paring knives too short, the slightly longer utility knives will give you even more versatility. Serrated Knife: A long (think 9 or 10 inches) serrated knife is important for slicing bread, slicing roasts and cutting very soft fruits and vegetables like tomatoes. This is one knife that you can save money on, buying an inexpensive version since many serrated knives don't resharpen well. There are many other knife shapes, some of which are quite specialized. As you learn about cutlery shapes you can determine whether or not certain shapes would be useful and gradually add them as needed. Forged knives are considered the best-quality. Each one is made individually from individual pieces of metal, and molded under extreme heat to create their shape. Forged knives are heavy, durable, balanced, and will typically hold a sharp edge well. A stamped knife means that it was punched out of a flattened sheet of steel, then the edges are sharpened. Generally these knives are less expensive and considered not as good of quality. They don't hold their edges as well as a forged knife, and their blades are lighter and more flexible. For some things, such as for a boning knife, this might be an advantage, though. The tang refers to the metal part of the knife that extends into the handle. A full tang means that the metal from the blade extends within the entire handle (and you can see the metal sandwiched along the edge of the blade). The advantage of a full tang is balance, the handle is slightly heavier, which gives you better stability and control of the knife. Some knives are made with partial tangs, in which the tang only extends along the top of the handle, or a rat-tail tang, which is a thin "tail" of metal that extends into the handle and is fully enclosed within the handle. Most reputable knife manufacturers pride themselves on the often-proprietary formula of metal they use to create their knives. Different metals and elements can add properties to the end product, including durability, ability to hold an edge, the ability to resist staining and pitting, and more. Certain aficionados love Carbon steel because of its strength, but it rusts easily and it can also react with certain acidic foods, discoloring the food. The most popular material for knives is stainless steel, which is a mixture of iron, carbon, chromium and other elements to create a blade that is a good balance of being durable, resistant to stains and easy to sharpen. There's also a high-carbon stainless steel, which gives the benefits of a stainless steel knife in a slightly more durable and sturdy blade. Ceramic knives also have their fans; this super-hard material is lightweight, ultra-sharp and will not dull easily. Of course, because it's ceramic, it'll shatter if dropped and can also chip or break if used improperly. Because ceramic is so hard, it can't be sharpened in a home sharpener, and likely will need to be sent back to the manufacturer or to a specialist to resharpen. As for the knife handles, you'll also find several different materials, including wood, composites, metal and different types of plastic. Wood looks great, but it can warp or degrade over time. Look for a plastic or composite that seems comfortable to the touch but stable to grip (keep in mind that you might be using your knife with wet or greasy hands), and that is securely riveted to the blade. Your cooking style: Think about how you cook and what sort of knives are best suited for the types of meals you prepare. For instance, if you're a vegetarian, you likely don't need a boning knife. How it feels: Never buy a knife without getting the chance to hold it in your hands and try it out (obviously, in a store you might not be able to actually slice food with it, but at least you can mimic the slicing, rocking motion to see if the knife feels balanced in your hand, and if the handle is comfortable. A good knife, if cared for properly, will last a lifetime, so it's important to choose wisely and buy the best knives for your needs.